A cold pack can ease swelling. Using a remedy for a fat lip can help ease the pain and irritation of an injured and swollen lip. Other possible causes of damaged and swollen lip tissue include insect stings or accidentally biting the interior lip (common among young children, especially in conjunction with a slip or fall). A swollen lip may or may not be accompanied by cuts or wounds. If any cuts or wounds are present, it is important to treat them properly to avoid infection. A simple remedy for a fat lip to reduce swelling is the application of a cold compress or ice pack to the affected area. You can use gel or liquid ice packs designed for first aid, ice cubes in a plastic bag, or even a bag of frozen vegetables. Cover the skin with a towel or cloth to prevent the ice from damaging the skin. Apply the ice pack or cold compress to the injured area for 10 to 15 minutes at a time to reduce the swelling and help the area heal. 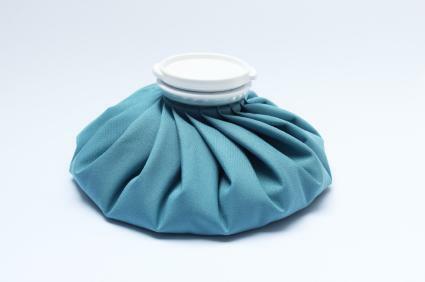 Applying cold packs as soon as possible after the injury occurs will aid in reduction of the swelling. If there is any area where the skin is cut or wounded, apply pressure with a clean cloth or piece of gauze until the bleeding subsides. A warm salt water solution can help reduce bacteria. External cuts can be cleaned with standard first aid cleaning solutions, however, be careful not to get solutions meant for external skin inside the mouth. If the skin is lacerated on the lips themselves, you can prevent cracking and treat the cut with medicated lip protectants. Over-the-counter pain relievers can also be used to help reduce pain. Ibuprofen has the added benefit of reducing the swelling of a fat lip. As the fat lip is healing, avoid acidic or spicy foods, especially if there is an internal cut.Lacerations inside or outside the lips should be evaluated in case they need medical attention. A deep cut may need emergency treatment such as stitches. Swelling as the result of a sting or bite should be treated slightly differently. Although cold compresses can help, an antihistamine can also be helpful in reducing the swelling. In this instance the swollen lip is largely the result of the body's response to the insect's venom. A paste of baking soda and water may also help with the swelling and ease pain in the affected area. Although it does little to offer immediate relief, know that time is a natural remedy for a fat lip. Within 24 hours, the swelling of a lip injury often subsides substantially. Although the swelling and injury of the lip area can be very painful and tender, it is also an area that tends to heal quickly. Remember that deep cuts may need emergency medical treatment, and any lip injury that does not respond to home treatment or does not show signs of improvement should be evaluated by a physician.